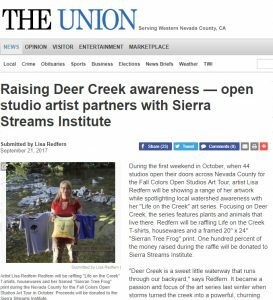 During the first weekend in October, when 44 studios open their doors across Nevada County for the Fall Colors Open Studios Art Tour, artist Lisa Redfern will be showing a range of her artwork while spotlighting local watershed awareness with her Life on the Creek art series. Focusing on Deer Creek, the series features plants and animals that live there. 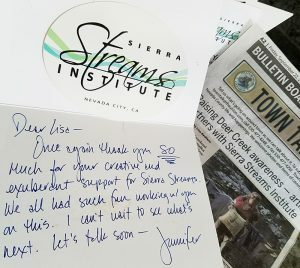 Redfern will be accepting donations for Sierra Streams Institute. “Deer Creek is a sweet little waterway that runs through our backyard,” says Redfern. It became a passion and focus of the art series last winter when storms turned the creek into a powerful, churning force that threatened homes and businesses. Redfern began blogging about it after photographing high water levels and comparing them to images she’d taken in 2011. Having recently read The Diary of a Forty-Niner by Chauncey L. Canfield, she was drawn to the Deer Creek references. As a writer as well as an artist, Redfern was inspired to use her blog, Following Deer Creek, to tell a bigger story about how the creek was formed, what plants and animals live around and within it, who are the native people that inhabited the area, how the gold rush and contemporary living habits have affected it. 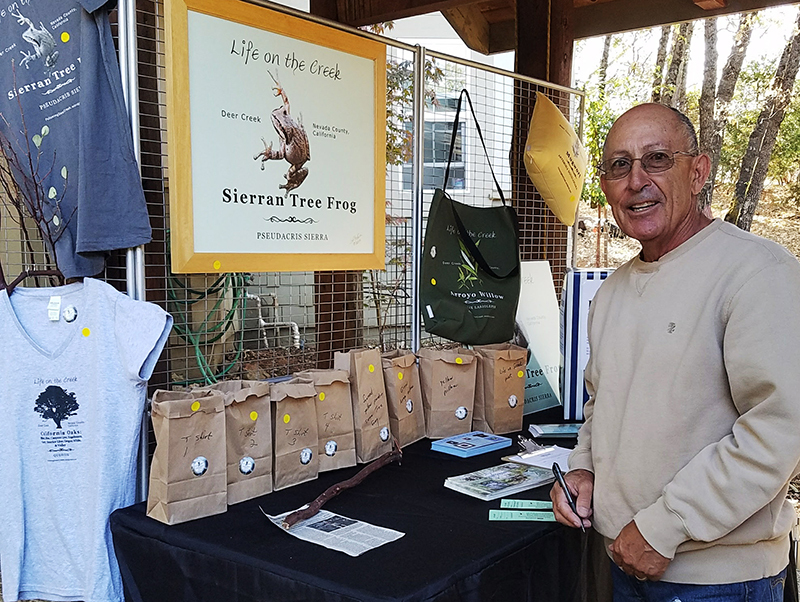 “Once I had enough information on the blog to show where I was going with the idea, I contacted Sierra Streams Institute,” said Redfern. Postcards with information on ordering custom Life on the Creek items online will also be available at Redfern’s booth. Fall Colors Open Studios & Art Tour – #26| Free & All Ages| Newtown near Discovery Way, Nevada City | 10 a.m.-5 p.m.